. 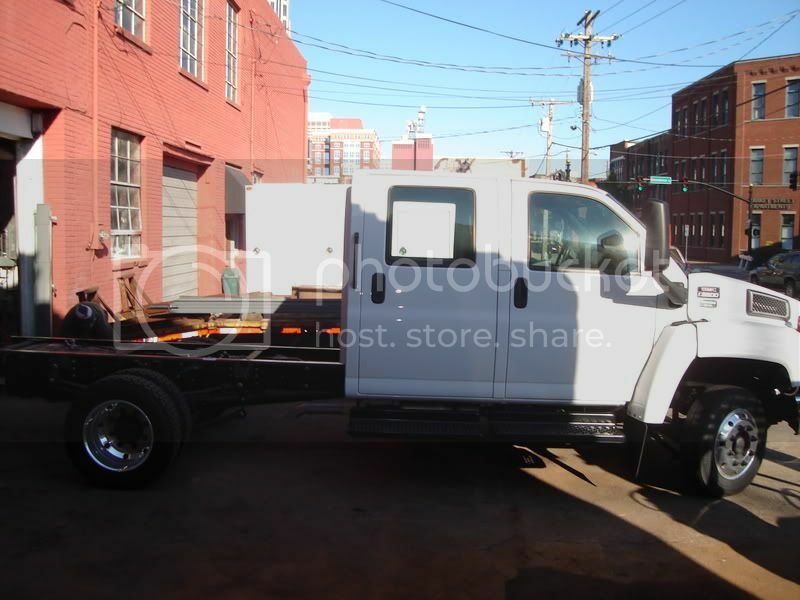 I asked the salesman about a trade in of my F-550 for one of the 5500. What a deal he made me. I would give him my 550, and buy his 5500.
it shore is a good looking truck though. i'm a big fan of the GMC so i might be a bit byest. What wheel base do you have Jeff? It is 165"wb the bed is 11 feet. still small enough to be able to get around, but big enought to carry some stuff with me. 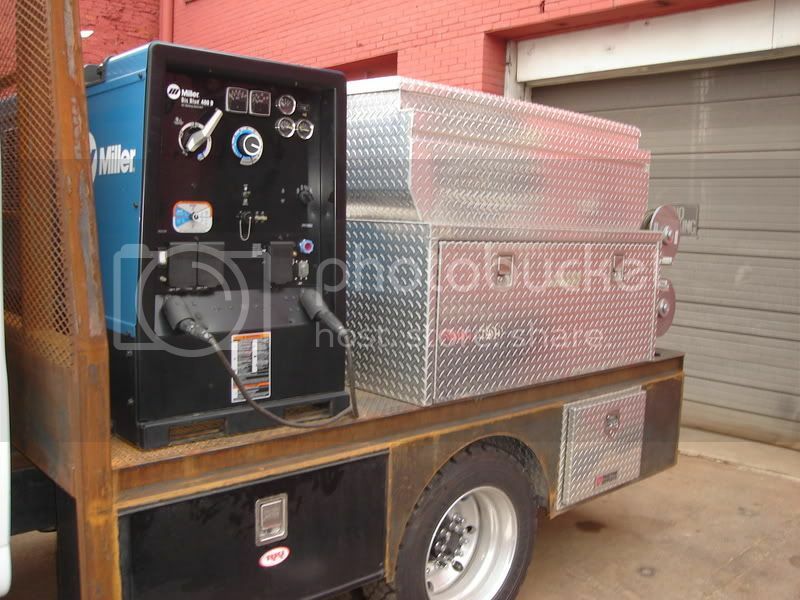 Take a welder, compressor, deck, and welding gear and you've maxed out the GVWR capability of an average dually 1 ton. Want to legally pull a travel trailer or utility trailer? If so it probably won't be on the same truck. F450 would do me fine, but not by a wide margin, so but no point stopping there, may as well get the 550 with the real axles. you're not adding any more size to the truck than if you had a 1 ton dually, it will still fit in the same box, it just has different parts under the skin. Thats not far off.My rig weighs in at 16,300 w/2 welders BB/TB ,1 IRcompressor ,tools, cables, metal,leads,reels,bottles,floor jack,ladder,creeper,air tools,rod.You can never carry enough in my line of work which one day is railings, next heavy equip repair, then some structural work the next day i do what ever work i can get i,m not very fussy.Some rig guys do just pipe i,m not one of them. If you spend much time off-road or in rough country, it definitely pays to have a truck rated to take a load considerably heavier than you actually have. Those dipsy-do's have a way of magnifying the load, all the wearpoints and stress points on the chassis deteriorate quick on a maximum-loaded truck. You have to remember, too, our trucks have a constant load all the time . . . you usually think of a loaded truck, say a delivery truck, well it goes out with a load, starts dropping stuff off, then it's empty, drives back home light. My truck, 100% of the miles are loaded, but since it's built for 32,000 lbs, and average weight is actually 25,000 lbs, it holds up well. I would think the same thing is true for the F550, rated at 19,000 lbs(?) but only carrying 16,000, would hold up better than if it was at max all the time. For mobile equipment I have a Trailblazer 250 with about 150' of leads. Oxy Acet. set-up with 100' of hose. Cutting torch and combo torch with all the attachments. HF251 TIG unit, a couple TIG torches and 140' of 14 pin remote cable. Miller S-32S wire feeder with 3 different guns plus a Spoolgun for aluminum. Most of that was carried in the left front comparment of the utility box. I carry 2 330cf gas bottles; 1 Argon, 1 75/25 horizontally under the welder in the front box w/100' of hose The front compartment of the utility box on the passenger side of the truck had a Craftsman 9 drawer box with a full set of mechanics tools. That box also held most of my spare parts such as hose repair kit, misc electrical connectors, torch tips, TIG and MIG gun parts, etc. The center compartment on pass.side carried my elect. tools; 2-4 1/2" grinders, 7" Grinder. Die Grinder, 3/8",& 1/2" conventional drills and a Hammer drill, Sawzall, Elect. Impact. Grinding wheels and electrodes. I would usually carry at least 10 lbs ea of 3/32 and 1/8" of 6010 & 7018, and 5lbs of 3/32"6013, Also some nickle rod for cast and some hardfacing rod. Spare spools of hardwire MIG, Dual Shield and Aluminum for the MIGs. Personally, I don't carry much 5/32 or 3/16 7018 as when I get into situations needing that size electrode I just grab the wire feed with D.S. Welding leads and control cables pretty much fill the rt rear compartment. On the left rear compartment I carried 100' of extension cord, 50-60 ft of chain and a few binders, Come-a-longs, a milkcrate full of c-clamps, 10 lb sledge, crowbars, and fire extingushier, 10 ton Porta-power, vise, and also had provision to strap a 60cf bottle if needed..
Center compartment carried all my TIG filler of which was mild steel, aluminum, stainless, magnesium and some "specialty" type fillers. Also in there was cleaning products, Dye Check kit, Tempil Stick kit, hardhat, hardhat welding hood, rags, paper towels, some paint, droplight and 150w flood lights, and assorted containers with nuts & bolts, rivets, sheetmetal screws, etc. Besides all that I carried a leather jacket, cape sleeves, coveralls, spare helmet head gear, water, jumper cables, and first aid kit. I also tried to anticipate anything that could go wrong with my equipment and carried many spares/simple repair parts. Nothing worse that getting on a job site and having a simple part malfuntion and not being able to complete the job. Not only does that cost me time and money but the customer looks at you like "What kind of an amature did I hire"
As someone else mentioned, I also painted the inside of the compartments white; really helped to see things when dark or low light. In building that truck I ran welding leads, 14 pin remote, and 110v power to the back of the truck. Saves having to drag cable and extension cords from front of truck and also easier to move around if I have to move to multiple locations on the same job site. 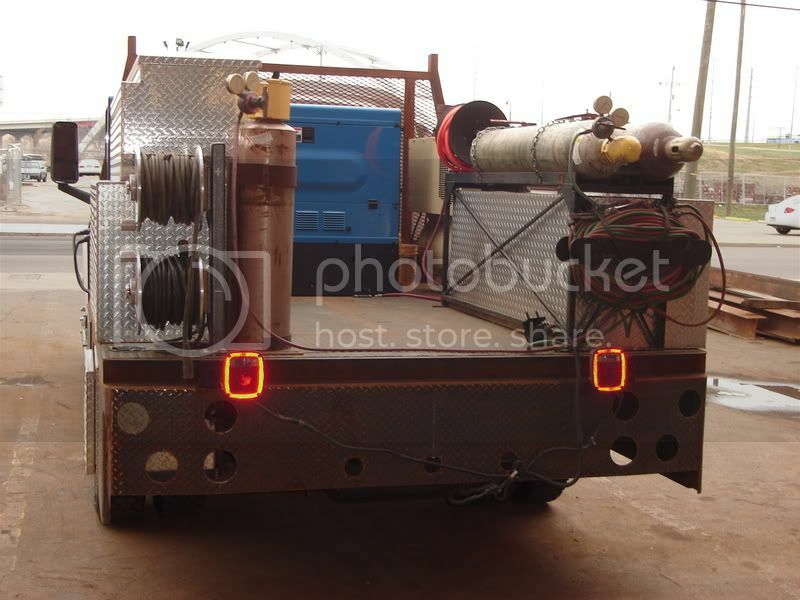 I attached a couple of pics of the old rig taken when the truck was about 10 years old. One, an overall view and one of the rt rear corner showing welding lead QC's, vise mount, remote and 110 outlets on body. All the other pics were 35mm so I would have to scan them to be able to post. I didn't have any racks on that truck for materials, again a zoning thing. I would usually carry a small selection of steel in the bed, and for bigger jobs, just have the material delivered to the jobsite. For the new truck I have some ideas on a removable rack for carrying 20' when needed. Hopefully money will be freed up a bit this winter and I can get the new one on the road. I miss my old rig and it's a real PITA working out of the pick-up. Aero, I am not sure how you get all that stuff on there. I only carry a small stick machine and about 10# of rod. I need to weigh it again tooled up, I had it calculated and I forget the numbers but mine is heavy and I carry a lot of stuff. I totally enclosed everything but I have complete air tools and pipe threading. One thing that had kept mine in the shed even more these days is battery impacts. I work from a pickup when I can but I aint a welding spe******t, one thing I find in my line of work is the ability to be hi problem solver with minimal resources and a sense of the stuff I really use and lean on. I am doing my own work so I have the luxury of pre-planning and pre-empting. I like having hi air and a lot of fittings, bolts, etc. I have a remote location, it was nice this spring to have it on the job as a gang box. I have kind of worked my way out of it though but for what I got into it even the occasional need makes it worthwhile and sometimes some petty contracting. I could get by with trailer mounted or skid, I can solve most field problems without welding anymore, my equipment goes out serviced and I have good trucking, I will haul a problem home if I can. New pic, same truck. I circle the top box, the lid folds open full length with the ladder in place and it is where I carry the "extra". I wanted to keep this thread going, so heres my new truck, 06 5500 gmc. I'll do more pics when bed is done. 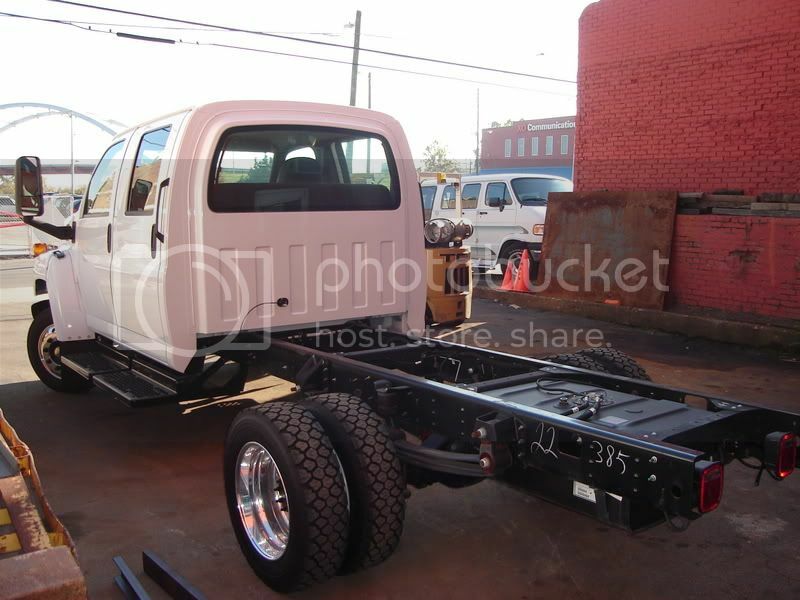 i would like to see truck completed,maybe when i come to music city in feb it will be done,any updates????????????? com/albums/c27/EricCarroll/ DSC00399.jpg[/IMG]Heres what Ive got done so far,I may be done by the time you come down but i wouldnt bet on it. very nice eric,when im down there next month i would like t come browse around and check your operation out,if it is ok. Thanks for the kind words there Aero weld and for sticking up for me, However its been a couple of years since you've seen my truck. Its not quite as shiny as when it was new and she's got a few rust spots starting on the bed and tool boxes, I'm hoping that they dont show on the pictures, however she still works just as hard as I ever ask her to. Jim I'm glad to hear you finally picked up a 550, let me know if I can be of assistance when you need to set the bed on. My crane can safely pick up 3,500 Lbs 8' out. As far as hauling 24' pcs of steel, installing a reciever tube in the front and rear of the truck with removable uprights. I cant imagine not beeing able to carry long pcs. Next thing youll want is a crane on your truck. I cant tell you all the jobs that I now can do because of the crane that I used to pass up on. As far as concealing the crane I seen a guy with a nice cover for his crane that really made it blend in. Jim, Its because of me seeing your F- 450 set up so nice that led me to build My F-550 and by the sounds of it your raising the bar even higher. Have you seen my buddy Verns Rig out of Plymouth, its the new GMC 4500 with the aluminum alcoa rims, its a butifull truck. looking good, but aren't you worried about the rust when it comes time to paint? I plan on having the whole bed sandblasted in the spring.That way I can run it for a while and if i want to change anything it wont be a big deal.Need to get/make a spool for my o/a now.I only get to work on it a few hours a week.I may get the bumper on today. So Portable has asked for pics of my set up. Thought I would revive this old thread. In 2009 after 23 yrs. at a fab shop they closed their doors & I went out on my own. I had already been doing mobile side jobs for 11 yrs. with a skid (no pics) & a 89 Chevy crew cab dually. At this time I had a 04 Chevy 1500 xtra cab with rear air bags. I didn't get a dedicated truck because I planned on doing mostly shop work at my shop & occasionally mobile as I had been doing. I turned out doing just the opposite & after 8 months decided to try a trailer first to see how it worked. For what I do the trailer is perfect. Last edited by MMW; 02-17-2013, 06:30 AM. I found a 6x12 v-nose enclosed trailer used. It already had brakes on a single axle & was rated at 3500 #. I ran it this way but was constantly at about 3500-3700#. I looked for a tandem & when I couldn't find one I added a second axle. I don't have recent pics but these are when I first was setting it up. I'll take some pics this week & post them.